There have been over 20 violent incidents against Christians so far this year, according to the National Christian Evangelical Alliance of Sri Lanka. Following a parallel surge in violent attacks on Muslims in the country, the alliance calls on the government to ensure the protection of minorities and their places of worship. “Since the current government took office in 2015, over 190 incidents of religious violence against churches, clergy, and Christians have been recorded,” said the alliance in a declaration on 27 May. 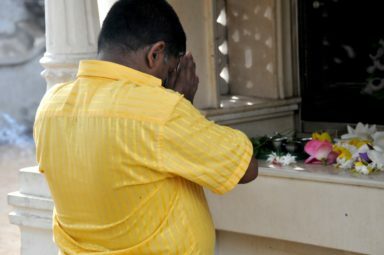 The recent attacks on Christians and Muslims have been blamed on a Buddhist nationalist organisation called Bodu Bala Sena (BBS) or the “Buddhist Power Force”. Venerable Galagoda Aththe Gnanasara Thero, the controversial Buddhist monk and leader of the Buddhist nationalist organisation who is in hiding. The police are seeking to arrest its secretary general, the controversial Buddhist monk Venerable Galagoda Aththe Gnanasara Thero, who is in hiding. Meanwhile, another BBS member was one of five people arrested for instigating religious violence against Muslims. In a video message released on 11 June, a BBS spokesman denied that the group was behind the anti-Muslim attacks, but accused the government of allowing Islamic extremism to flourish in the Buddhist-majority nation. 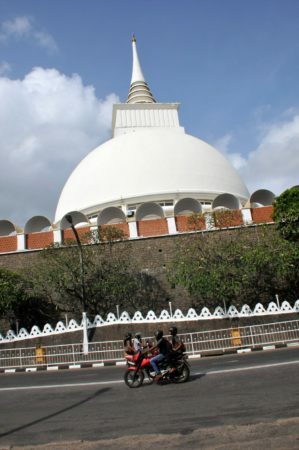 “Within a decade or two, Buddhism will be under serious threat in Sri Lanka,” spokesman Dilanthe Withanage said. Human rights groups, religious leaders, lawmakers and the United Nations have all called on the Sri Lankan government to take immediate action against sectarian violence and growing tensions in the northern and eastern parts of the country. The Christian Evangelical Alliance pointed out that freedom of religion or belief (FoRB) is a fundamental right guaranteed by the constitution but that protests continue to occur unrestrained against minority places of worship. “The 2008 government circular, requiring new places of worship to register, continues to be misapplied by local authorities to close down churches and threaten Christian clergy to discontinue their activities,” it said. One recent example of this was the story of Sampath*, a church leader in south-western Sri Lanka. In March, after a Sunday morning service, a group of about 50 people, including Buddhist monks, forced entry into Sampath’s church, the Christian Fellowship Church in Ingiriya – in the Kalatura District, which has been badly affected by the recent floods and mudslides. World Watch Monitor was told that the group threatened those who were still in the church, demanding that they stop holding services. Later, when the police arrived, they reportedly accused church members of “disrupting the peace”. At the police station, Sampath was asked if he had permission to hold church services, but he said he did not know that he needed permission. A mob of around 200 people gathered outside the police station, including two dozen Buddhist monks, who began shouting and blocking Sampath and his wife’s passage home. When the couple eventually made it home, they found that their house had been pelted with stones, which had smashed the windows. When Sampath confronted the mob, who had followed them home and were still shouting, he was hit with a pole. President Maithripala Sirisena and Prime Minister Ranil Wickremasinghe have both ordered police to “uphold the law”, but the violence continues. According to UCAN, another large protest against a Christian place of worship was staged on 18 May in Devinuwara – in Matara district, in the south – by around 2,000 protesters, including 30 Buddhist monks. The surge of religious and ethnic violence is particularly concerning in a country that only emerged from a civil war in 2009 – a war that lasted more than 25 years, during which between 70,000 and 80,000 people were killed. In Sri Lanka, race and religion are intertwined and the background to the simmering tensions and outbursts of violence is the commonly-held belief that “to be Sri Lankan is to be Buddhist”. Understanding this belief, thought to be held by more than 70% of the population, is key to understanding the opposition to minority religions, especially Christianity (7% of the population), Hinduism (12%) and Islam (9%). The island-country is 45th on the Open Doors 2017 World Watch List, which ranks the 50 countries where Christians are most under pressure for their faith.